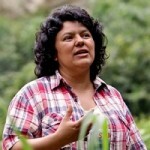 Shocking revelations were released Tuesday that link the assassination of renowned Honduran indigenous environmental leader Berta Cáceres to the highest levels of the company whose hydroelectric dam project she and her indigenous Lenca community were protesting. Shocking revelations were released Tuesday that link the assassination of renowned Honduran indigenous environmental leader Berta Cáceres to the highest levels of the company whose hydroelectric dam project she and her indigenous Lenca community were protesting. New York Times reporter Elisabeth Malkin has read the new report by a team of five international lawyers who found evidence that the plot to kill Cáceres went up to the top of the Honduran energy company behind the dam, Desarrollos Energéticos, known as ”DESA.” The lawyers were selected by Cáceres’s daughter Bertha Zúniga and are independent of the Honduran government’s ongoing official investigation. They examined some 40,000 pages of text messages. The investigation also revealed DESA exercised control over security forces in the area, issuing directives and paying for police units’ room, board and equipment. The recovery of Puerto Rico after Hurricane Maria dominated a Senate hearing Tuesday and was supposed to be the focus of another hearing in the House today, before it was canceled. San Juan Mayor Carmen Yulín Cruz was set to testify at the hearing alongside FEMA chief Brock Long. Earlier Tuesday, Long testified before the Senate that his agency had nothing to do with approving the controversial $300 million no-bid contract with Whitefish Energy, a tiny company based in the Montana hometown of Interior Secretary Ryan Zinke. Meanwhile, Democracy Now!’s Juan González says other companies are moving in to privatize other services on the island, such as the public water utility. While in Puerto Rico this past weekend, Democracy Now! spoke to Ángel Figueroa Jaramillo, the head of UTIER, the electrical workers’ union in Puerto Rico, about Elon Musk’s proposal to make Puerto Rico the model of sustainable energy. A federal judge has blocked part of Donald Trump’s transgender military ban. A trans former marine is challenging the ban, and six active-duty transgender servicemembers sued the Trump administration.